My last column dealt with George R. R. Martin’s A Song of Ice and Fire, and why I thought it was important. One of the reasons that series hit so close to the mark for me was that after growing up with a voracious appetite for epic fantasy in the vein of Lord of the Rings, I eventually grew tired of it. I didn’t feel like large, sprawling fantasies in medieval European settings were offering me anything new, anything I hadn’t seen in slightly different forms elsewhere. The last epic fantasy I remember being impressed by before A Song of Ice and Fire was Tad Williams’s Memory, Sorrow and Thorn series, which eventually helped to inspire Martin’s own take on the genre. That epic fantasy fatigue is why I understand when people say they aren’t into fantasy. Too often those derivative epic fantasies come to represent the whole genre, and that makes it seem stale. I’m not saying that writers don’t make their versions unique, but the tale of the farmboy who becomes king amidst an epic battle between Good and Evil has been done to death. Which is why I like to suggest that people look to fantasy settings outside those traditional epic-fantasy worlds. For the purposes of this discussion I’m looking primarily at secondary worlds, worlds created wholly by the author and therefore not our Earth. Fantasy is rife with secondary worlds, and some of the most famous are worlds like Middle Earth, Narnia, Oz, Earthsea. But I’d like to shine the spotlight on some non-medieval settings (or in the last case, a non-traditional medieval setting). In all of the following examples, the setting is as much a part of the book as the characters and plot. In a sense, all of these locations are characters. Ambergris is the setting of three of Jeff VanderMeer’s books -- City of Saints and Madmen, Shriek: An Afterword, and Finch. Like most of the settings on this list, Ambergris is a city, though it is part of a larger fictional world. Unlike the medieval worlds mentioned above, Ambergris at the time of the first stories seems to come from a technological era more similar to say the 17th or maybe early 18th century. For me Ambergris always had a kind of European feel, but a post-colonial Europe. Some of the images evoke a Paris or Italy, but you can sense the influence of the equivalent of the Middle-East or Asia hovering on the edge. Many of VanderMeer’s stories veer into horror and I’d contend that part of that is because the city, with all its dark and weird happenings, can often remind us of the world in which we live. Ambergris is as filled with the mysterious, the odd, and the grotesque as a carnival. Mushrooms and other fungi feature heavily in the Ambergris stories, and that sense of richness, that sense of bloom and decay seems to color the whole city. In fact, there’s almost an odor of the sickly sweet about the whole place when you’re reading about it. And, like other kinds of mushrooms, it can sometimes verge on the dreamlike or surreal. The most fantastic element of the city, aside from the general sense of weirdness that seems to pervade it, has to be the presence of the mysterious Gray Caps, a mushroom-like people who were the original inhabitants of Ambergris. Their presence and their agenda are explored throughout the stories and they embody much of the mystery and darkness of the fiction. What helps Ambergris to truly live is that unlike some other fictional cities, it actually changes over time. I once heard VanderMeer remark that real cities change tremendously over time and that fictional cities should, too. The span between the first Ambergris story and the last is 200 years and change is evident in that time frame, not just in architecture, but in technology. The technology level of the early stories seems almost Victorian whereas in Shriek: An Afterword there are cars and firearms. By the time of Finch, Ambergris technology has moved into the equivalent of our mid-20th century. Like any other character, the city grows and changes. Ultimately, though, what makes Ambergris work, even more than the strange fungal weapons of Shriek or the Festival of the Freshwater Squid, is the fact that it reflects real cities, that it is recognizable to us, even if it’s fantasy. Many of VanderMeer’s stories veer into horror and I’d contend that part of that is because the city, with all its dark and weird happenings, can often remind us of the world in which we live. 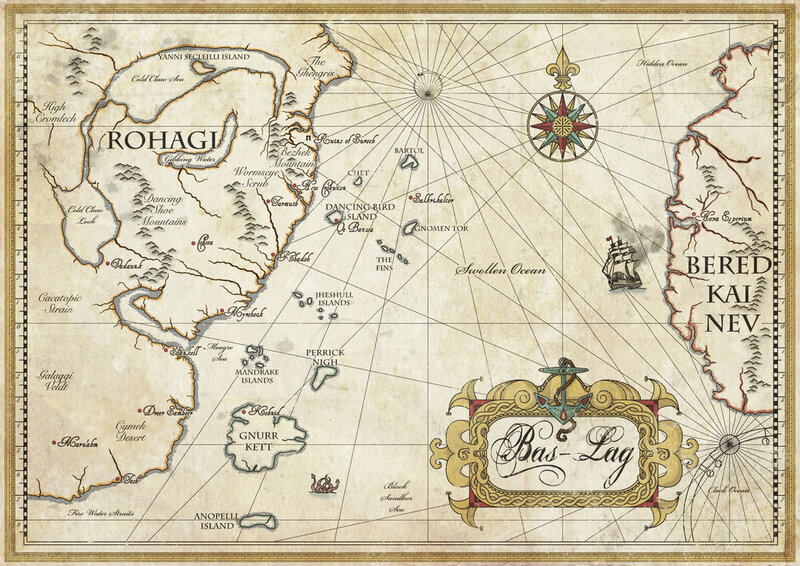 China Mieville’s Bas-Lag appears in three of his novels - Perdido Street Station, The Scar, and Iron Council. You know you’re in for an original world when you open the pages of Perdido Street Station, which takes place in the city-state of New Crobuzon. Instead of the stereotypical elves and dwarves, New Crobuzon is populated by Cactacae (humanoid cacti), Garuda (bird people), Vodyanoi (a froglike aquatic people), and the Khepri (humanoids with scarab beetles for heads) in addition to common humans. There is magic, of course, these being fantasy books, but there is also science. Using a kind of steampunk level of technology, Mieville includes primitive robots as well as Remade, people who have been altered, some merged with machines. And then, of course, there are the Weavers, spider-like creatures who can exist between many dimensions and sometimes interfere in the course of events. And these are just some of the races and creatures that Mieville introduces over the course of the three books, not to mention technology and magic. Like Ambergris, the setting evolves over time. Also like Ambergris, Bas-Lag, and specifically New Crobuzon, seems to overflow with the dark and the weird. Mieville’s creation is full of the grotesque and the beautiful, often side by side, sometimes in the same individual. Female Khepri, for example, have the bodies of human females, though their heads, as mentioned, are scarab beetles. They also can create wondrous works of art by excreting from their scarab parts. New Crobuzon is gritty and urban with effluvium from smoke stacks spat out into the air, and massive, looming structures like the titular Perdido Street Station. The city is run by a corrupt and sometimes brutal government, and yet criminals, artists, spies and junkies eke out a living in its cracks and crevices. When some writers play it safe by sticking to the familiar, Mieville goes all out in painting and populating Bas-Lag, and while many of his creations are inspired by real world mythology, he makes all of these elements his own. I place another of Mieville’s creations on this list precisely because of its difference in style and scope from Bas-Lag. Besźel and Ul Qoma are fictional cities existing ostensibly in our own world in the novel, The City and the City. Even for fantasy, they are fascinating creations. Both cities occupy the same space, but overlap in some areas. Denizens from one can see into the other and vice versa except that laws exist to prevent this. As a result, citizens must “unsee” the other city. If this careful arrangement is violated, a breach occurs and an organization, suitably shady, called Breach must deal with it. Upon this compelling framework, Mieville constructs a murder mystery that ends up involving both cities and Inspector Tyador Borlu, originally of Besźel, must cross into Ul Qoma to investigate. With a hard start, I realized that she was not on GunterStrász at all, and that I should not have seen her. Immediately and flustered I looked away, and she did the same, with the same speed... When after some seconds I looked back up, unnoticing the old woman stepping heavily away, I looked carefully instead of at her in her foreign street at the facades of the nearby and local GunterStrász. Unlike Bas-Lag which is a cornucopia of ideas and elements, Besźel and Ul Qoma are more subtle creations, more restrained but no less powerful. Though they exist on the fringes of Europe in the novel, they are original, each with their own sense of culture, their own languages, their own realities. Besźel, for example, is a declining city with its best years behind it while Ul Qoma seems to be on the way up, scoring the best trade agreements. In some ways, creating believable fictional cities in our own world is harder than a secondary world and yet Mieville pulls it off, imbuing each city with authenticity. In some ways, creating believable fictional cities in our own world is harder than a secondary world and yet Mieville pulls it off, imbuing each city with authenticity. Yet what really makes these cities truly powerful is that they reflect our own world back at us. Like the denizens of Besźel and Ul Qoma, we often learn to unsee things in the world around us, and framing these things in fiction can often highlight them. So the kind of blindness we have as part of one society looking out at another, the unseeing that we do in our daily lives, becomes clear as we read about it in Mieville’s fictional cities. I would be remiss in listing non-tradtional settings if I didn’t mention Lankhmar, one of my favorite fictional settings of all time. While technically medieval in era and technology, Fritz Leiber’s Lankhmar, the setting for the Fafhrd and Gray Mouser stories, was one of the first such fantasy series to shift its attention from the country to the city and to alter the scope of the stories from the fight between Good and Evil to the fight of two rogues to get by. Part of the allure of such sword and sorcery tales was moving the focus to the characters and making the ultimate struggle a more personal one. Unlike the love of the pastoral that Tolkien showed in Lord of the Rings or that Lewis had in the Narnia books, Leiber filled Lankhmar with smoky bars and seedy back alleys. 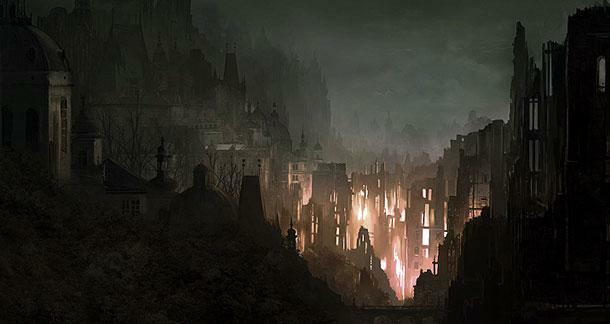 Like some of the other cities mentioned previously, it’s filled with characters who would be seen as villainous in any heroic fantasy -- thieves, crime lords, beggars, corrupt priests, shady mages, and so on. 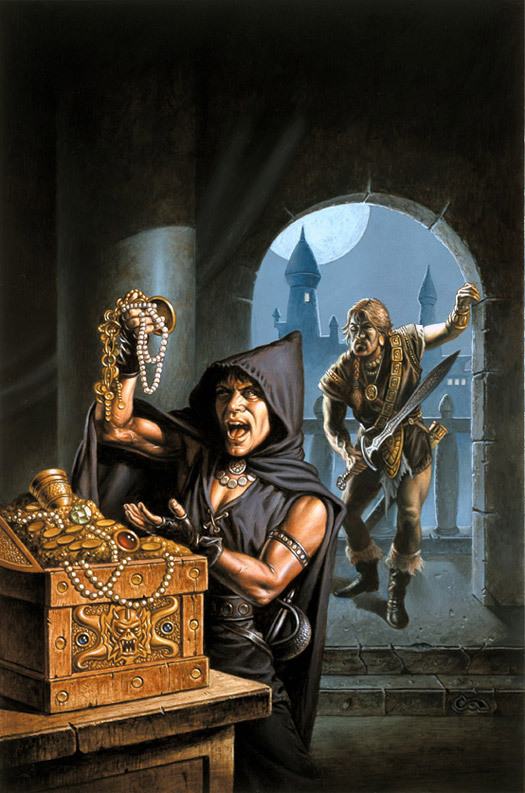 Even the heroes of Leiber’s Lankhmar tales, Fafhrd and the Gray Mouser, are often little more than thieves who hire themselves out for coin. Like most of the other cities on the list, though, Lankhmar is overflowing with strange delights and mysterious dangers. Though a city with taverns and a Thieves Guild may now seem commonplace to anyone who has ever played D&D, the elements of Leiber’s stories still drip with originality whether it be the undercity populated with sentient rats or Fafhrd’s turn as a servant of the god Issek of the Jug. And while Lankhmar has a largely European feel to it, with its temples and bazaars it shows influences of both Middle-Eastern and Asian cultures as well. In fact, while Lankhmar is the setting of many of Fafhrd and the Gray Mouser’s stories, it’s just part of Nehwon, the larger world, which, too, contains strange, wondrous delights like the Cold Waste, Fafhrd’s birthplace, where snakes are furred and hot-blooded. Or the hut of the wizard, Sheelba of the Eyeless Face, which crawls around on posts, not unlike the hut of Baba Yaga. Even better, it doesn’t take itself seriously and indeed many of the Nehwon stories have humorous elements. Of course there’s nothing wrong with epic fantasy worlds with swords and magic. Some writers are tackling non-traditional settings in their epic fantasies. Saladin Ahmed has created a pseudo-Arabian medieval world for his debut novel, Throne of the Crescent Moon, which mostly takes place in the fictional city of Dhamsawaat. Throne is influenced highly by sword and sorcery such as the aforementioned Lankhmar, but has a very distinct middle-eastern feel. Instead of the usual knights or wizards or thieves, the heroes of Ahmed’s book are a veteran ghul hunter named Doctor Adoulla Makhslood and his dervish sidekick, Raseed bas Raseed. Later they hook up with Zamia, a young woman from a desert tribe who can turn into a lion. Together they fight ghuls, which are a bit like zombies, but not quite, raised by evil sorcerers to do their bidding. Ahmed's heroes are products of the world he's created, fresh and exciting but with a touch of the familiar to pull us in. His friend was right about one thing: Adoulla was, praise God, alive and back home—back in the Jewel of Abassen, the city with the best tea in the world. Alone again at the long stone table, he sat and sipped and watched early morning Dhamsawaat come to life and roll by. A thick necked cobbler walked past, two long poles strung with shoes over his shoulder. A woman from Rughal-ba strode by, a bouquet in her hands, and the long trail of her veil flapping behind. A lanky young man with a large book in his arms and patches in his kaftan moved idly eastward. Ahmed brings Dhamsawaat to life, detailing its sounds and scents, even going so far as to describe the foods that Adoulla eats in such a way that my mouth waters every time I read the passages. Dhamsawaat may seem like the Baghdad of the Arabian Nights, but Ahmed makes the city his own and populates it with a cast of characters that includes the Falcon Prince, a revolutionary, and Miri, Adoulla’s beloved who runs a brothel. I had the pleasure of reading this while in manuscript form and I was excited to see something that felt so fresh and different in the field of epic fantasy. Further books in the series will focus on djinn and the version, in this world, of the Crusades, only from the Arabian perspective. I'm looking forward to seeing where this series goes and looking forward to more Arabian-influenced elements. What are your favorite non-traditional fantasy settings? What attracts you as exciting and fresh? Or, if you are an epic fantasy fan, feel free to point out in the comments examples that avoid the well-worn ground mentioned above. I'd love to hear from you. This column makes me want to re-read the Bas-Lag and Ambergris novels. Godsdamnit, those books were fun. Great article - in complete agreement with the 'medieval European' setting being a tired model- I've set most of my fantasy in an alternative 'Eastern' world - more akin to Persia/The Mediterranean and South East Asia. I'd love to see HBO do a series on an Urban Fantasy book(s) with a real BladeRunner type cityscape. That would so rock. Ummm... The entire Dune Universe? I'm a big fan of China, especially PERDIDO, and JVM's FINCH is excellent too. This was a great article. Thank you. My two pennies: I very much enjoyed Clive Barker's world(s) of Imajica. This was a great article! Thanks for giving me a few new authors to check out! Ahmed's work also reminds me of The Rose of the Prophet trilogy that I keep wanting to reread, and Scott Oden's The Lion of Cairo. @Dennis - I agree completely about the HBO show. There seem to have been a couple of "real world meets fairy tale" television shows lately, but I'd love something darker and grittier. @Rex - yeah, if I was covering science fiction I'd definitely include the world of Dune. Dune is my favorite novel. @laurelin - Thanks for the recommendation. Imajica is something I've been meaning to check out for a while now. I need to do so. @Heidi - Wow. I actually remember The Rose of the Prophet from back in the day. I remember reading the first book and liking it but then lost track of the rest of the series and then it was out of print (or seemingly unavailable). I admit a penchent for being taken to a more distant shore. For that reason I delved into Desert of Souls, and Arabian fantasy, as well as Range of Ghosts, by Elizabeth Bear, which features Mongolian spices (along with mist dragons!). 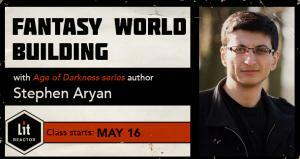 Reading fantasy is a vacation to another world for the price of a sandwitch. I care not to restrict myself to one destination. My own writing has taken me on a mind-journey to Mohenjo-daro, a Mesopotamian city built on a flood plane. The city was named "Hill of the Dead" because floods kept devestating it, but people came back because of the area's fertile lands. My next safaris will take me to a magical Egypt and Africa. I've been meaning to check out Mieville and VanderMeer both, now I'll have to move them to the top of the queue. But you forgot one of the greatest: Mervyn Peake's Gormenghast series. Peake is a great choice. I need to reread those books, I think. I was young when I first tackled them. And I think both Mieville and VanderMeer were influenced by Peake, certainly more than by Tolkien.